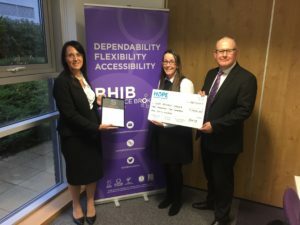 BHIB are delighted to be new supporters of Hope Against Cancer, having made a 2 year commitment to raise funds for the charity. Chris Hutchins of BHIB is seen donating a cheque for £1,250 to Tracey Hallam of Hope Against Cancer. Also in the picture is Julie Walker of BHIB who presented a certificate to Tracey. Nigel Rose, Chief Executive – Hope Against Cancer said “We are delighted with this exciting new partnership with BHIB and are extremely grateful for the commitment they have made to raising funds for us. They are a great and enthusiastic team to work with and are helping us to fund vital, life-saving cancer research right here in Leicester for the benefit of cancer patients now and in the future”.